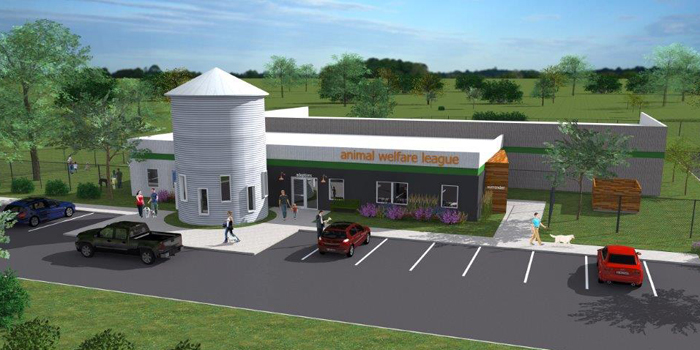 Pictured is a rendering of what the new Animal Welfare League building will look like. KOSCIUSKO — Spring is a season of warmth, joy, and new beginnings. The Animal Welfare League of Kosciusko County will soon have its fresh start in a brand new facility estimated to open in spring 2019. On Sept. 11, Board President Woody Zimmerman and Executive Director Katey Wilks Zemen signed the contract to begin building the new Animal Welfare League of Kosciusko County shelter, located at 1048 S. CR 325E, Pierceton. In early 2014, the AWL began its capital campaign to raise funds for the new building. The current building, located at 3489 E. CR 100S, Pierceton, is too small for the number of cats, dogs and other animals it shelters. The new facility is approximately twice the size of the old building and will have separate HVAC systems to avoid cross-contamination. Key features of the new shelter include independent quarantine for dogs and cats, an inside dog run, free-roaming cat observation room, an animal education center, separate cuddle rooms for dogs and cats and the ease of disinfecting the facility. Wilks Zemen said she is very excited for construction to begin for the new facility. “This is going to be a very nice and updated building for both the animals and the community,” Zemen said.